Learn from renowned serial entrepreneurs as they share their core knowledge, wisdom, strategy and tactics in a startup’s lifecycle. Gain new perspective and discover emerging trends required to accelerate and sustain growth! Gain invaluable insights from global and regional social entrepreneurs as they share their entrepreneurial journey, and educate you on essential aspects of driving a social enterprise. Sharpen your technical skills and acumen to multiply your social enterprise’s impact and performance and connect with like-minded people for continuous improvement and learning. 100+ exhibiting booths, our startup career fair allows you to explore, connect and gain access to a community of like – minded entrepreneurs and talents! and not to forget the appearance of celebrities-turned-entrepreneurs, Joe Flizzow and Altimet during the startup career fair. To find out more about #MA2016, visit us at: academy.mymagic.my/ma2016 and purchase your tickets! To enjoy discount, just key in promo code when purchasing the tickets. 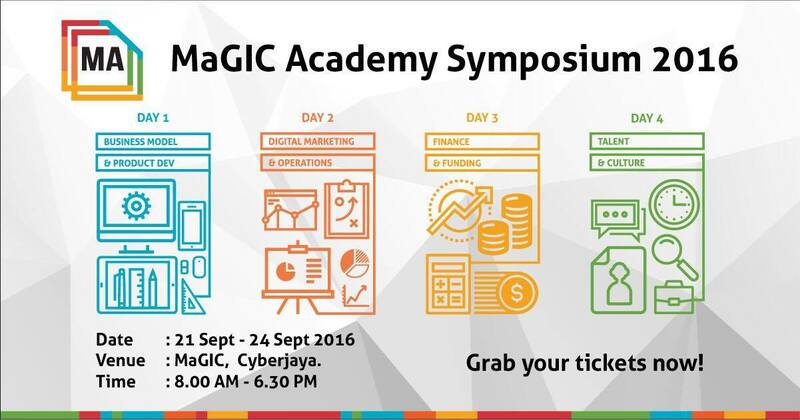 Malaysian Global Innovation & Creativity Centre (MaGIC) will be hosting a third symposium, MA2016. 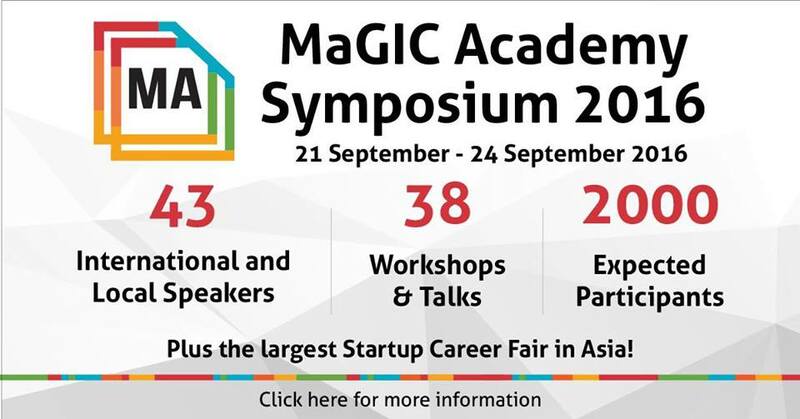 The highly anticipated and not to be missed signature event will be held in MaGIC from 21 September 2016 till 24 September 2016 with an expected crowd of 2000 participants, consisting of startups, social entrepreneurs and job seekers as well. In addition to the entrepreneurship track, MA2016 will feature the social enterprise track whereby participants will be exposed to the same amount of knowledge and skills with the overarching objective of expanding the social enterprise ecosystem in Malaysia. 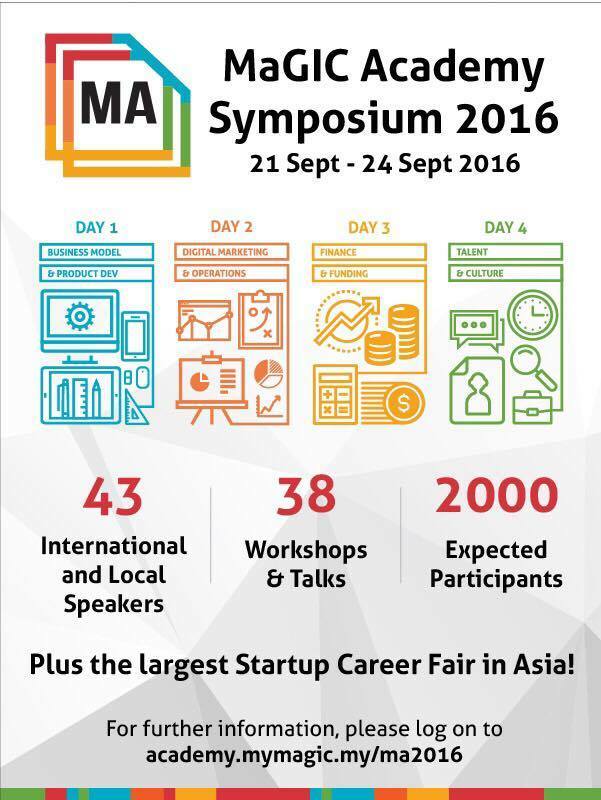 Following the success of the previous #MA2015, the key takeaway for this year’s audience is the exposure to key note speakers from successful global entrepreneurs, hands on workshops, fireside chats with mentors, ‘speed dating’ with potential investors, and on the fourth day – Asia’s largest startup career fair.